The new Toyota Yaris makes the everyday bolder, brighter and better. Now available at Arnold Clark. Make way for a supermini with super powers. With its striking honeycomb front grille, fantastic connectivity and confident design, the new Toyota Yaris has the edge. Inside, you feel the energy the minute you step in. Streamlined curves, a multimedia system to keep you in the loop, and a fluid driving experience combine to make the new Yaris outshine the rest. The new super-responsive 4.2-inch TFT multi-information display gives you Bluetooth-connected multimedia and a six-speaker audio system, plus a dazzling array of safety and comfort options. 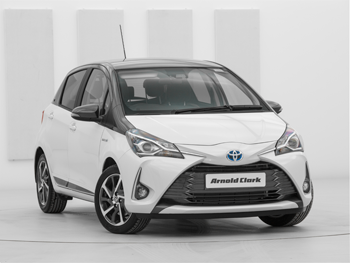 There’s more space than ever in the new Yaris, with extra legroom for passengers in the back and a 286-litre boot, which increases to 786 litres with the seats folded down. So there’s nothing to cramp your style. Toyota’s impressive Safety Sense System makes no compromises. The new Yaris boasts driving assistance as standard, including rear view camera, Pre-Collison system and Road Sign Assist. Add that to Toyota’s five-year warranty and you can drive on the wild side, while knowing you’re in full control. 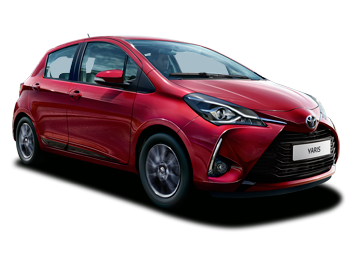 The hybrid version of the all-new Toyota Yaris has all the same cool features, with added city-ready electric mode for lower emissions. 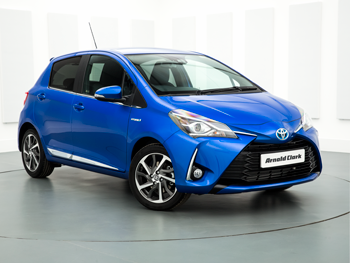 Now we’re giving you the chance to take the Yaris Hybrid for a test drive. You’ll see how its smooth electric motor conquers traffic, and find out exactly how much fuel you’ve saved.